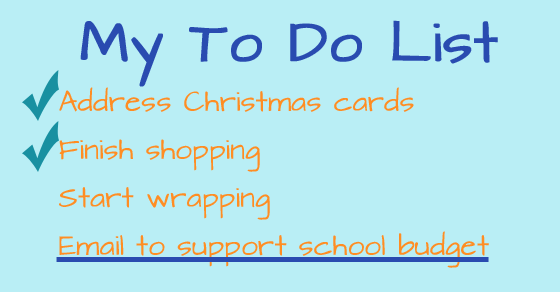 I know you’re rushing to prepare for the Christmas holiday, but would you add one thing to your to-do list? If you support public education in Cecil County, please reach out to our County Executive and County Council to let them know where you stand. I’ve said it a few times lately–if you support public education or, for that matter, support any program funded at least in part by Cecil County, you need to contact our elected officials to let them know how important these programs are for growing and sustaining our community. There are citizens who regularly speak at county council meetings, telling officials that money shouldn’t be “wasted” on schools and social programs. We need to start voicing our support for school funding and continue to let our voices be heard year round or risk our silence being considered consent for the status quo. Contact the County Executive and members of the County Council today. The Board of Education will spend the month of January preparing a budget that will be submitted to County Executive Tari Moore in mid-February. At the end of March, the County Executive submits a proposed countywide budget to the County Council. During April and May, the Board of Education will make a budget presentation to the County Council and a public hearing will be held with everything culminating in a County Council vote on the budget at the beginning of June.